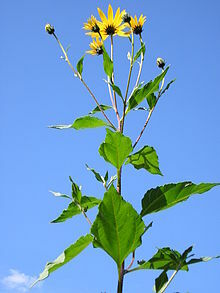 The Jerusalem artichoke (Helianthus tuberosus), also called sunroot, sunchoke, earth apple or topinambour, is a species of sunflower native to eastern North America, and found from eastern Canada and Maine west to North Dakota, and south to northern Florida and Texas. It is also cultivated widely across the temperate zone for its tuber, which is used as a root vegetable. The herbaceous plant is perennial. It can reach heights of up to 3 metres (9.8 ft). The leaves are oval, and grow to 7 centimetres (2.8 in) to 10 centimetres (3.9 in) wide, and 10 centimetres (3.9 in) to 25 centimetres (9.8 in) long. The plant has been imported to Europe, and it is seen as an invasive species - few animals eat it, and it will take away the space of other plants. This means that often, there is uncontrolled growth. The plant has been used to make spirits and sugar. It is a food plant for animals such as horses and pigs. People who suffer from diabetes often use it: Up to sixteen percent of the plant is made of the polysaccharide inulin. In the 1980s, the Jerusalem artichoke also gained some notoriety when its seeds were planted by midwestern US farmers at the prodding of an agricultural pyramid scheme. There was little market for the tuber in that part of the US at the time, but farmers were assured it would soon appear on the commodity market. The only profits were realized by the initial distributors and the first few levels of farmers (who sold their seeds to other levels of the pyramid). As a result, many of the farms that had planted large quantities of the crop were ruined.